Apple cider and bourbon create a new twist on an old classic. Being back home is sad and lovely all at the same time. Honestly, if we stayed in Charleston any longer, we wouldn’t have wanted to come back. I literally ate just about everything Charleston had to offer. Hands down, my favorite Charleston dish was collard greens. You guys, they were top notch. I ate collards every single day–no lie. Squirrel and I did a ton of fun stuff. We went on a horse-drawn carriage ride through the city and learned some fun facts from our very knowledgeable tour guide. We ate. Oh, boy did we eat. I mean, we ate everything. If you’re looking for a foodcation, Charleston is the place to go. We didn’t rent a car; instead, we decided to save the money and hike our way through the town. It’s not a huge town, but when you’re walking it every day, you get some exercise. It worked out great, considering I ate just about everything in sight. The cobblestone streets just about killed me. I must have tripped and almost broke my ankles on several occasions. Do not wear heels in Charleston. I took one pair and they stayed stowed away in my luggage the entire time. Wearing heels in Charleston is like asking for a visit from death. One slip on the cobblestone, and you’re a goner. I’ll be posting our trip in photos next week, so stay tuned for more on our foodcation. This week’s #SundaySupper is all about sauces. My favorite sauce is caramel. The sweet, sticky, gooey sauce tastes like burnt sugar and goes great on just about anything sweet. 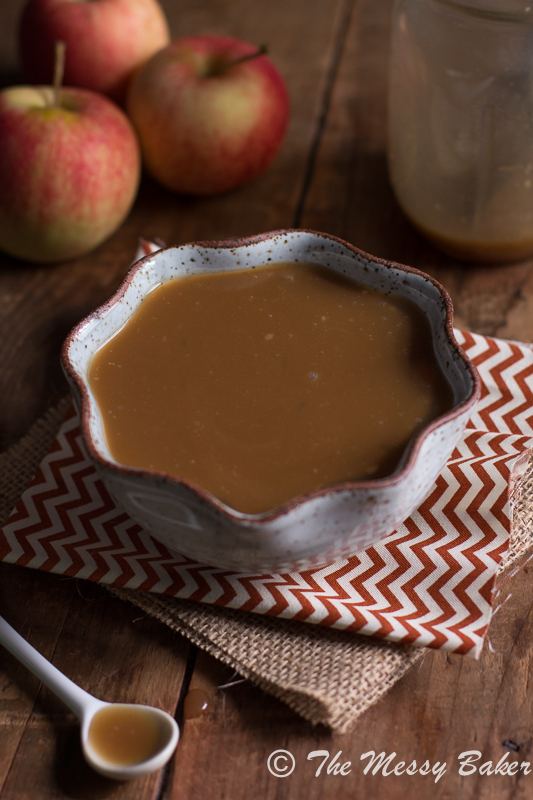 I decided to jazz things up a bit and make an apple cider bourbon caramel sauce. I know, right. Bourbon! In my humble opinion, bourbon makes everything better. It takes an ordinary recipe and adds depth. I love cooking and baking with it, so I always have a bottle in my cabinet. The apple cider adds a lovely sweet tang to the caramel. The flavor is unlike any other caramel sauce I’ve ever made. The bourbon adds hints of oak an vanilla. The combination is decadent. 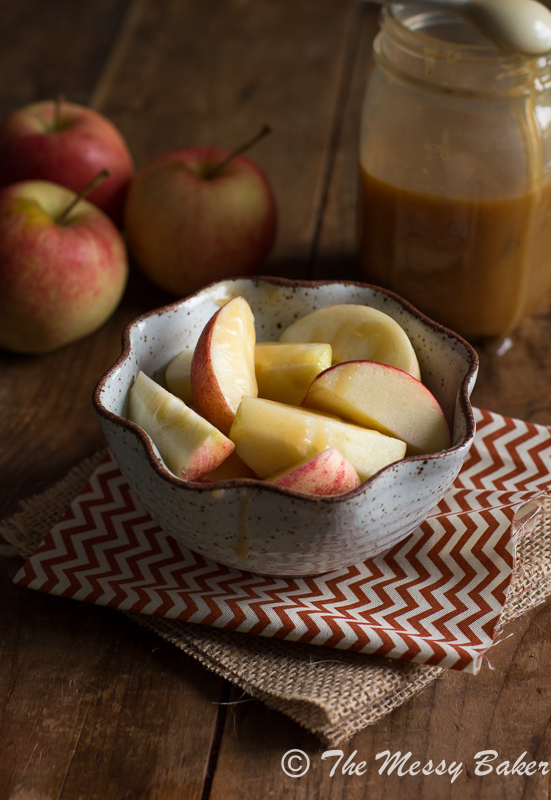 Drizzle it over apples, and you have yourself a sweet treat. This has to be the easiest recipe for caramel that I’ve ever made. You’ll begin by reducing the apple cider. Reducing it concentrates the tangy apple flavor. Concentration equals flavor, and we’re all about flavor here on The Messy Baker. After the cider reduces, you add the butter, brown sugar, and cream. Let it get all happy and bubbly. Allow the mixture to come to a steady bubble and whisk for 2 minutes. Take the mixture off the heat and stir in your bourbon. DO NOT stir in the alcohol while the pot is over the heat. That’s a big no. We don’t want your house catching on fire. Always remove the pot from the heat before adding any alcohol to your recipe. Got it. Great! I don’t want anyone blaming The Messy Baker for a house fire. So, remove before booze. That’s our new motto. You’ll want to eat this caramel every single day of your life from here on out. You’re welcome. Cook cider in a medium-sized saucepan over medium heat, stirring occasionally, until the cider reduces to 1/4 cup, about 8-10 minutes. Turn the heat up to medium-high and add butter, sugar, and cream. Bring the mixture to a boil, stirring constantly. The mixture should boil vigorously for 2 full minutes. Remove the pan from the heat and whisk in the bourbon. Cool the mixture completely. Store in an airtight container and refrigerate for up to 2 weeks. To reheat, microwave for 10-15 seconds. Join the #SundaySupper conversation on twitter each Sunday. We tweet throughout the day and share recipes from all over the world. Our weekly chat starts at 7:00 pm EST. Follow the #SundaySupper hashtag and remember to include it in your tweets to join in the chat. Check out our #SundaySupper Pinterest board for more fabulous recipes and food photos. Oh so fun!! It sounds like such a great time! And yummmyyyy sauce! Thanks, Kayle! Next trip… Eating my way through NYC! You had me at caramel, but adding cider and bourbon? You’re my dessert hero! I love baking with bourbon, and I sometimes love to sip a glass after dinner to relax. I love to sip on bourbon and bitters. Thanks, Laura! THIS IS SO COOL! Jennie, be my best friend and send me some, okay? Wow this sauce – this is all my favorite fall flavors all in one! Amazing!! Mine, too, Megan. I just love me some bourbon. Oh man! This looks great! 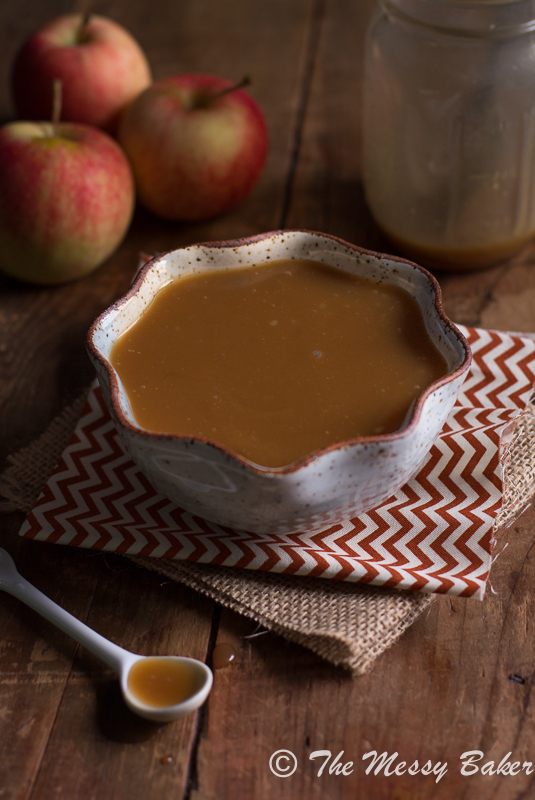 I love apple cider sauce and since you added bourbon to it, even better!!!!!!!!!! You had me at the title of this post. That caramel sauce sounds unreal. And your trip sounds so fun! I’ve never been, but my parents were there over the summer and had the BEST time, can’t wait to see pics! Thanks, Kristina. I highly recommend visiting one day. So much food, so little time. I want it all…even the collard greens. The collards were the best, Jen. I ate my fair share of greens, that’s for sure. I just bought some apple cider for another dessert. I’m going to have to make sure I have a cup left now. YUMMMM! Save that cup, girl :) Thanks. I am seriously in love with this sauce. I think I want to pour it on everything!! Pouring it on everything is always recommended. Thanks! Oh dear! I wish you hadn’t posted this! I can now see myself putting on at least half a stone over the next few weeks! Looks delicious though! Thanks, Beth. Yeah, this sauce can become easily addictive. Sounds like your trip to Charleston was fun and what caramel sauce is complete without booze? Thank you for participating this week. Booze=delicious caramel. I totally agree, DB. Thank you so much! I want to drink it with a straw!!! AMAZING! Pinned! You’re welcome ;) Thanks so much, Liz. OMG. This looks and sounds AMAZING! This sauce needs to happen! Thanks, Nicole. Hmm, I’ll trade ya. Sauce for sauce? I’m glad you had a great vacation! Can you please send me 3 jars of this?! Thanks, Stephanie. You’ll wanna make it six. this is fabulous: here’s why. i was going to make some sauces to give away at christmas, and i was thinking “ooh, what about an apple cider caramel sauce” but i hadn’t done any research to find out how to go about it. now? NO RESEARCH! here it is, right here. thank you, jennie. and all my gift recipients thank you as well. I’m excited to hear that you’ll be making this for the holidays. I hope your friends and family love it as much as I do. It’s always nice when you can skip right over research. 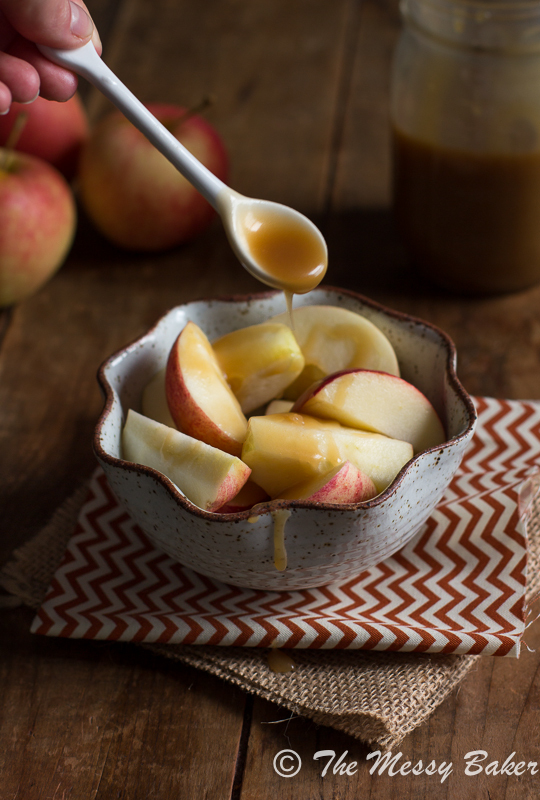 This caramel sauce looks ahh-mazing! Perfect with some apple slices! Bourbon does make everything better! I am so glad you did not kill yourself while walking the cobblestones in heels. I cannot wait to see the pics from your foodcation! Me, too. I almost cracked my ankle in half a few times. Yes, bourbon is awesome! Delicious recipe!! Welcome back from holiday!! Reading your post made me smile cause my husband’s name is Charleston and I’ve always teased him about going there :D Sounds like you had an amazing time! Jaime, I love that your hubby’s name is Charleston. You should totally visit; the food is amazing. Pass that spoon this way! Heck just pass the whole jar! I´m leaving you some love.. haha..
Love the idea of this recipe.. caramel sauce with a huge difference.. I need to try it!! Thanks for the love, Johlene! I glad you enjoy my site. This caramel can easily be consumed with just a spoon. I think you just put all of my favorite words in one amazing recipe. YES! Lol I definitely would’ve sued you if my sleeve & then my apartment burst into flames ;) It would kinda be worth it to make this amazing caramel sauce though. We are totally on the same boozy caramel-y wavelength which is why we’re friends. I love that you used apple cider. I can’t wait to make this and drink it from the jar (because that’s the best way to consume caramel). Can’t wait to see all your photos from your vacay. 24/7 food sounds like my idea of the perfect holiday! Drinking this straight from the Mason jar would make all my dreams come true. Thanks! 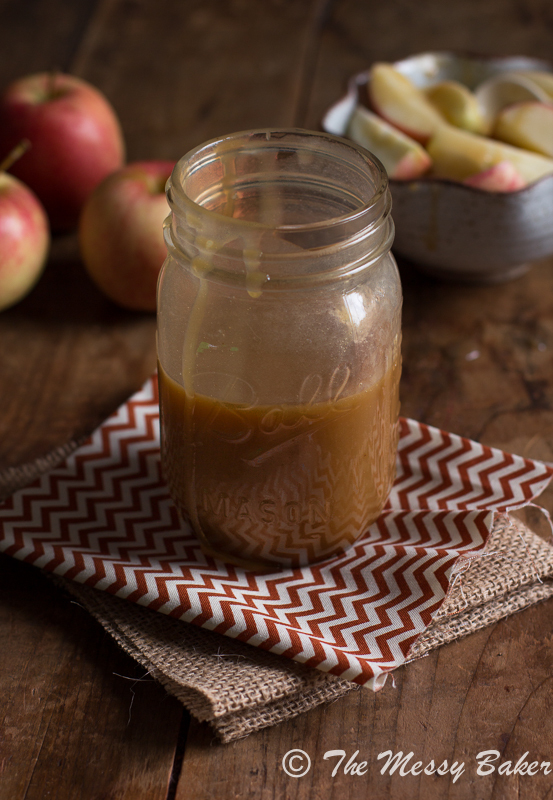 Oh wow — apple cider AND caramel AND bourbon?! That’s just too much fall goodness in one recipe. I’d love to dip some apple slices in this, or just eat it straight from the jar! I am in complete agreement that Bourbon makes everything better — although my husband would probably be dismayed that I had used his bourbon for something other than drinking, haha! Gotta love bourbon. Eh, he won’t miss a little smidgen of bourbon from the jar. I agree, spoon this into my mouth. Thanks, Jamie. Great idea to add the bourbon!! Love it!! Want it!! Thanks, Tara. If I could, I’d add bourbon to just about everything. This has everything I could ever dream of in one sauce!! Hello gorgeous, I want to pour you over everything!! Cider – caramel plus bourbon? It sounds, and looks amazing! And jazz it up you did!! Cider caramel would have been amazing alone but that splash is bourbon, spectacular!! Apples and bourbon AND caramel? Sign me up! I’m addicted to caramel. I virtually drink the stuff. Welcome home!!! Sounds like you had a wonderful vacation! So you decided to take an already wonderful sauce and make it even more irresistible! I’ll be making this tomorrow! Thanks for this great creation! Thanks, MJ! I hope you love the sauce as much as I do. Let me know how it turns out.